Even with tongue-depressor sticks named "Space Man" and the lure of using M&M candies as space markers, some primary students still struggle to space between words. It's hard for them to manage their writing and craft their ideas at the same time. They are juggling numerous tasks at once: thinking of details, using the word wall, forming their letters, staying on the lines, and so much more. After expending all that mental energy, spacing is often a low priority in their minds. Students don't always see the purpose behind spacing between words. They know what they wrote; it's not hard for them to read their writing without spaces. But for us to decipher it is more difficult. Prepare a single sentence writing with one word per piece of tag board. First graders are amazing writers. Then call five students up front. (Consider identifying the five students who are having the most difficult time remembering to space between words.) Have them face the class, each holding one word, and stand in order. Reinforce that each of these students is a word; the words together make a sentence. Then begin to squeeze the students together, squishing them. Force them to move closer and closer to each other. Wait for one of them to complain. "He's too close. This is too tight. I'm being squished." And then you've got it! The moment you've wanted! Jump on it! Point out how the "words" don't like being squished together; they each want their own space. That mental image and physical discomfort is enough for many students to remember to space when writing in the future. Bring in a dozen domino pieces. Call the students over to the carpet space to watch you. Slowly set the dominoes in a row. 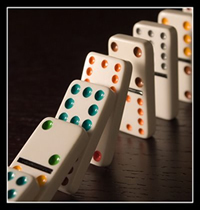 When you've got them displayed, with a single flick of your finger, start the tumble of dominoes falling one by one. Share in the excitement with the students. Suggest you do it again; they won't argue. The third time, set up the string of dominoes, and while you do, begin to point out the similarities between the dominoes and sentence writing. Explain that each domino is like a word. And several words in a row make a sentence. And when you read the words in a sentence, the ideas just flow. (Flick your finger and send this third string of dominoes falling.) This last time, setup the dominos with no space between them--just one butted up against the next. Then attempt to send the dominoes trickling and act shocked when they don't flow smoothly. Ask the students why it didn't work, and they all know the answer. Because you didn't leave space between the dominoes. That's right! Without spaces your dominoes don't flow. Without spaces between words, your sentences don't flow either.